With the advent of World War II, some of the most famous war coverage in broadcasting history enraptured Roanoke listeners. Edward R. Murrow, who anchored a pan-Europe roundup of war news from Vienna, became a CBS staple and international celebrity. The Roanoke Valley heard H. V. Kaltenborn’s hushed cries, “Calling Ed Murrow! Calling Ed Murrow!”when the signals from Europe grew faint. Entertainers produced patriotic music to support the American war effort. Patriotic American music took on new importance in these days on WDBJ, along with the growth of big band orchestras, and timeless performers like Frank Sinatra, Tony Bennett, Doris Day, Ray Contif, Henry Mancini, and Count Basie. Country music was still present on 960 AM, but as the decades passed, listeners heard fewer traditional fiddle tunes in favor of more commercial honky-tonk and bluegrass. According to the Blue Ridge Institute at Ferrum College, it was also during this period, as TV grew in popularity, that WDBJ and other radio stations began broadcasting fewer live performances and using less local programming in favor of slick network acts. Roanoke had its first television station in 1953 and within just a few years live country music had all but disappeared from the dial. After twenty years, WDBJ moved once again, this time to the building of its then-owner, Times-World Publishing, at 201 West Campbell Avenue. From 1956 to 1969, the radio station operated out of the building’s 2nd floor. WDBJ took up residence in the newspaper offices for 13 years. 1956 was also the year the station hired one of its best-known and longest-serving air personalities, Ted Rogers. 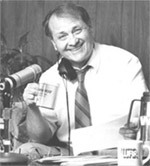 Rogers moved to the Roanoke Valley from Raleigh, North Carolina, and worked for 960 AM as a DJ and personality for 34 years, retiring in 1990. Perhaps best known for the advice segment, “Ask Your Neighbor,” Rogers’ name was synonymous with Roanoke radio for the last 15 years of his work at the station.